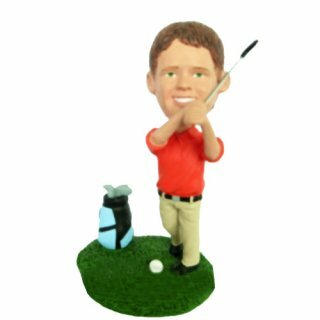 Standing in front of a golf ball,with the golf bag at side, this custom male golfer bobblehead doll is taking a swing while wearing a orange polo shirt and khaki pants.Details like golf shoes and belt will be fine craved carefully. 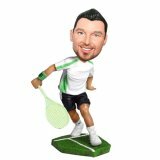 Does any of your friends a golf lover? Make his head bobbling on this customizable body. I bet he will scream out like a lady, for it is really extreamly like.